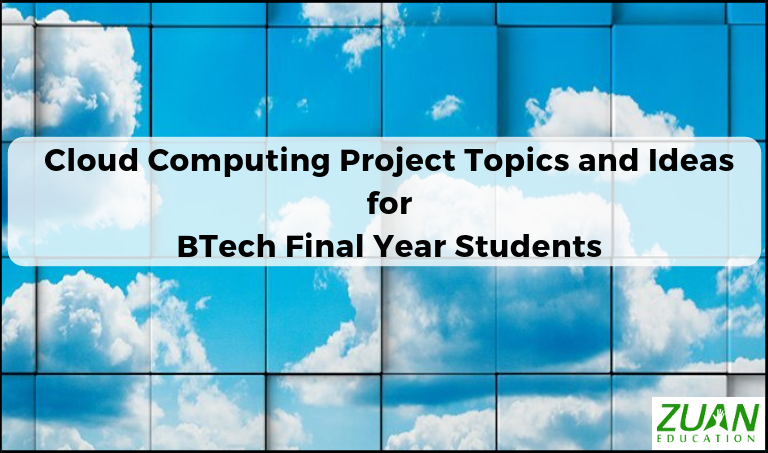 Cloud Computing Project Topics to work on during your final year BTech. The thought of doing a project in your final year may make you shiver. But it need not be so. To start of, you will feel so. But then, once you are into the actual work you develop a passion for research. You should understand that your project work is a good chance to show your creative innovation. So don’t miss this opportunity. Don’t run away from it. Stay cool! The other side to start of and complete your projects are as follows. Talk a lot with your peers and friends about your project title. Choose a title that will be considered applicable in the future. It is your first chance for research. It is the tipping point for your working with project works when you get a job. Choose a friendly MNC or Startup company or whatever to guide you in your project. Project work is not an exam. It is creative fun. Think about your project in your city/town/village park side, the beach, coffee shops, restaurants etc. It is not a punishment given to you. So keep your head cool. Find a good friend who can stay with you to help until the completion of your project. Especially during nights. I mean a night owl! This is an interesting topic among cloud computing project topics. The main objective here is that the system is to minimize the cost due to power consumption and server deployment. Also for minimum use of green energy. Combining renewable energy and ensuring high availability are two major requirements for geo distributed data centers. Correspondingly, you can propose a mixed integer linear programming formulation for capacity planning. Meanwhile, also minimizing the total cost of ownership (TCO) for high available green, distributed data centres. Furthermore, in the process, cost due to power consumption and server deployment is minimized. Significantly, there is a minimum use of green energy. Eventually, this model results in showing that capacity provisioning with green energy integration reduces carbon footprint and TCO. Results also reveal that 40% of green energy usage is feasible. Accompanied with a marginal increase in TCO compared to other cost-aware models. There is an increasing demand for shipping capacity. Therefore, modern ships are thinking of greater sizes and more complex structures. On the other hand, operational safety, economy and environmental protection of ships are facing a challenge. The goal is to upgrade equipment intelligence, industrial chain capability and upgrading management intelligence. In the light of this, you can propose, the following for overall architecture of cyber-enabled ship control and management system. That is “Two Terminals and Two Clouds (2T2C). This consists of a perception and control terminal, an intelligent management terminal, and a hybrid cloud platform. The SOMS system based on 2T2C architecture is applied to the iDolphin 38,800-ton intelligent bulk carrier. This has achieved good results with real ship data. Eventually, it can control the full-life operating costs and energy consumption. This can be useful among cloud computing project topics. Data analytics and mobile computing are significant for healthcare systems. Moreover, it is useful to meet many technical challenges and problems needed to be addressed to realize this potential. Significantly, there is a need for advanced healthcare systems upgradation. Especially, with new capabilities such as machine learning, data analytics, and cognitive power. This project presents a detailed design for developing intelligent healthcare systems assisted by data analytics and mobile computing. Moreover, some representative intelligent healthcare applications are discussed. That will give an evidence that data analytics and mobile computing are available to enhance the performance of the healthcare services. This discussion can result in as an evolving subject among the cloud computing project topics. There is a surge in Vehicular Ad Hoc NETwork (VANET) research. But future high-end vehicles are expected to use less of the onboard computation, communication, and storage resources. In this project you can put forth the taxonomy of VANET based cloud computing. First, you can define VANET Cloud architecture. This is an useful discussion in the cloud computing project topics. Attribute-based encryption (ABE) is widely used in cloud computing. Furthermore, the standard ABE system does not support deduplication system. Significantly, this is needed to eliminate duplicate copies of identical data for saving storage space and network bandwidth. In this project, you can discuss about an attribute-based storage system with secure deduplication in a hybrid cloud setting. Here, a cloud is responsible for duplicate detection and a public cloud manages the storage. This project proves two advantages. First, it is used to confidentially share data with users. Done by specifying access policies rather than sharing decryption keys. Secondly, it achieves the standard notion of semantic security for data confidentiality. RDIC enables a data storage server or a cloud server to prove a verifier of honest data storage. Correspondingly, in this paper, you can propose a new construction of identity based (ID-Based) RDIC Protocol. This is done using key-homomorphic cryptographic primitive. This reduces the system complexity. Moreover, to reduce the cost for establishing and managing public key authentication framework in PKI based RDIC schemes. Significantly, the proposed ID-based RDIC protocol doesn’t leak the information of the stored data to the verifier. The new construction is secure against the malicious server in the generic group model. Moreover, it achieves zero knowledge privacy against a verifier. Friends, the above are some of the good list of topics that you can rely on for research. You can also think of other topics on cloud based computation, cloud computing services, other cloud services. Also, cloud data, amazon ec2, cloud resources etc. See you coming with flying colours contributing in a small way to the world of creativity and innovation!